What are your thoughts on raisins? Being that we just had Christmas I am guessing more than one of you got disappointed when you perused the cookie table, selected a chocolate chip-something and had your soul crushed when your tooth landed on a raisin. And then another one. With no chocolate chips anywhere to be found. Heartbreaking, isn’t it? Don’t mistake me for a raisin hater, though. I like raisins. I like them in bran muffins. I like them in oatmeal. I like them in ants-on-a-log. Just don’t try to to put them in cookies disguised as chocolate. I can’t take the disappointment. If I make cookies for you, I promise they’ll have chocolate chips in them. Probably a lot. In some cases, like this one, they might even take a chocolate bath. But no sneaky raisins here. You can count on that. In a medium saucepan, melt the butter over medium heat. Once melted, remove from the heat. Add sugars and stir until smooth and blended. Chill the mixture for a few minutes until cooled. Add in the egg, egg yolk, and vanilla and stir well. Incorporate dry ingredients. Stir in the Skor bits and chocolate chips. Drop large spoonfuls onto cookie sheet and lightly sprinkle with sea salt. Chill for 30 minutes. When ready to bake, preheat the oven to 325 degrees. Bake for 12 minutes or until just set. 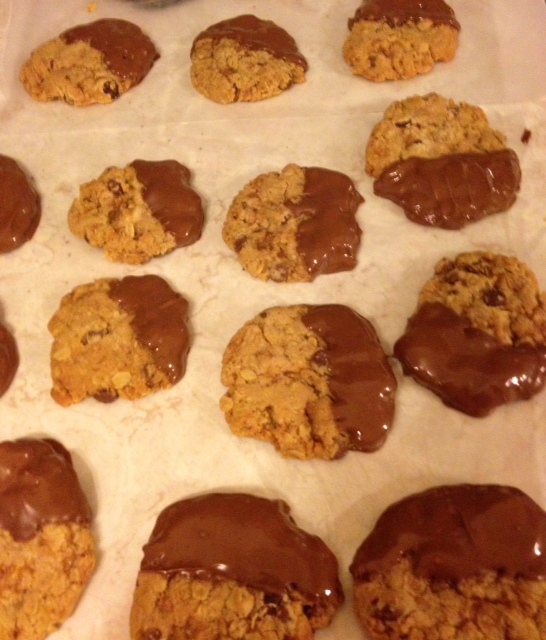 Once cookies are cooled, melt chocolate wafers in a double boiler. Dip each cookie halfway in chocolate, then place on a parchment lined cookie sheet. Once chocolate is set, store cookies in an airtight container.